For the first time in 8 years, a ray of hope is emerging from a long near decade of unnecessary and avoidable deaths that drove down the life expectancy in the United States for three years in a row. According to Blue Cross Blue Shield Association’s data, diagnosis of opioid use disorder declined, with 5.9 per 1,000 patients diagnosed in 2017 opposed to 6.2 per 1,000 in 2016. The news coincides with other national data posted seen recently as well. This does not mean overdose deaths will drop anytime soon, a grievous reminder that rebuilding from this continuous crisis has a much longer recovery time than predicted. ”The data from BCBS is certainly good news and promising,” Eleanor Artigiani, the deputy director for policy at the University of Maryland’s Center for Substance Abuse Research, told VOX news. This may not be from one factor alone, as many aspects may be responsible for the downturn in potential addicts. 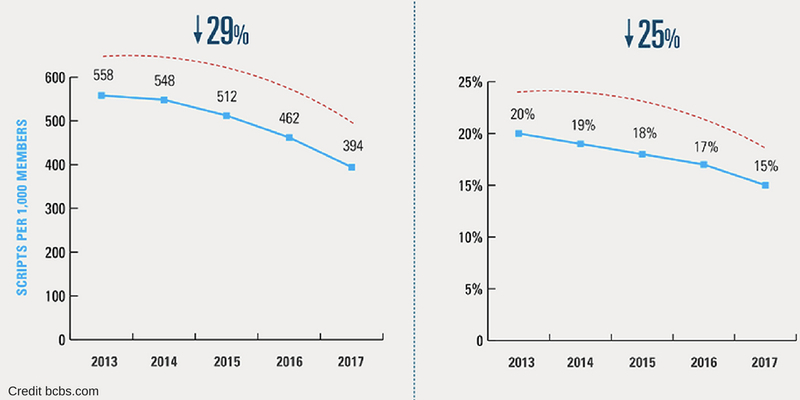 Opioid prescribing numbers are down 30% from 2013 to 2017. Previously, two-thirds of opioid prescriptions filled in 2017 went against the CDC’s recommended guidelines. Threatening the downturn is the dangerous synthetic opioid fentanyl, which is now responsible for nearly half of all overdoses for the past two years nationwide. More drugs are being mixed with Fentanyl to strengthen their drugs and make them more desirable to addicts on the street, which means one relapse could be the end for someone in recovery. Luckily, treatment is looking to be more accessible thanks to the initiatives lead by President Trump and his task force. Congress is beginning to make new advances in improving options for recovery, medication assisted treatments and doctors abilities to prescribe those. Lawmakers are slow to back the plan and spend the necessary investments needed, but help is trickling in. Although BCBSA information is good news, it still carries sufficient cautions. Our nation is improving, but we need consistent and overwhelming support from our lawmakers, federally and statewide.